There are a wealth of charges and counter-charges concerning actions undertaken by Saddam and by the international community towards Iraq. Based on publicly available information, the facts contained in this report demonstrate that under the regime of Saddam Hussein, Iraq continues to repress its people, threaten the region, and obstruct international efforts to provide humanitarian relief. We are helping the Iraqi people in their efforts to bring about a regime that is committed to living in peace with its neighbors and respecting the rights of its citizens. We want to see Iraq return as a respected and prosperous member of the international community, and as the evidence shows, this is unlikely to happen as long as Saddam Hussein is in power. As long as Saddam Hussein is in power, we are determined to contain the Iraqi regime and prevent it from threatening the region or its own people. We will also continue our efforts to increase humanitarian relief for the people of Iraq, over the obstructions of the regime. Sanctions were imposed on Iraq by the international community in the wake of Iraq's brutal invasion of Kuwait. They are intended to prevent the Iraqi regime access to resources that it would use to reconstitute weapons of mass destruction. Sanctions can only be lifted when Iraq complies fully with all relevant UN Security Council resolutions. Saddam Hussein's regime remains a threat to its people and its neighbors, and has not met any of its obligations to the UN that would allow the UN to lift sanctions. The international community, not the regime of Saddam Hussein, is working to relieve the impact of sanctions on ordinary Iraqis. Sanctions are not intended to harm the people of Iraq. That is why the sanctions regime has always specifically exempted food and medicine. The Iraqi regime has always been free to import as much of these goods as possible. It refuses to do so, even though it claims it wants to relieve the suffering of the people of Iraq. Iraq is actually exporting food, even though it says its people are malnourished. Coalition ships enforcing the UN sanctions against Iraq recently diverted the ship M/V MINIMARE containing 2,000 metric tons of rice and other material being exported from Iraq for hard currency instead of being used to support the Iraqi people. Baby milk sold to Iraq through the oil-for-food program has been found in markets throughout the Gulf, demonstrating that the Iraqi regime is depriving its people of much-needed goods in order to make an illicit profit. 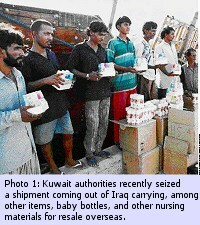 Kuwaiti authorities recently seized a shipment coming out of Iraq carrying, among other items, baby powder, baby bottles, and other nursing materials for resale overseas (see photo 1). Saddam Hussein's priorities are clear. If given control of Iraq's resources, Saddam Hussein would use them to rearm and threaten the region, not to improve the lot of the Iraqi people. There is ample proof that lifting sanctions would offer the Iraqi people no relief from neglect at the hands of their government. Sanctions prevent Saddam from spending money on rearmament, but do not stop him from spending money on food and medicine for Iraqis. Saddam's priorities are clear: palaces for himself, prisons for his people, and weapons to destroy Iraq's citizens and its neighbors. He has built 48 palaces for himself since the Gulf War. He would not use Iraq's resources to improve the lives of Iraqis. Saddam Hussein would use them to rearm and threaten the region. Thanks to the oil-for-food program, the people of Iraq, especially those in the north, are getting needed foods and medicines. The program would be even more effective if the Iraqi regime were cooperating. Iraqi obstruction of the oil-for-food program, not United Nations sanctions, is the primary reason the Iraqi people are suffering. Iraqi oil exports are now at near pre-war levels and revenues are above what Iraq was receiving during the Iran-Iraq war. For the six-month period June-November 1999, Iraqi oil exports are projected to exceed $6 billion (see chart 1). Previously Iraq had said it was unable to produce enough oil to meet oil-for-food ceilings because the UN refused to approve contracts for spare parts for its petroleum industry. The facts demonstrate otherwise. In the two and a half years that the oil-for-food program has been functioning, Iraq has been able to sell over $14.9 billion in oil. Iraqi oil exports are near pre-war levels, and rising world oil prices are allowing more oil-for-food goods to be purchased. The oil-for-food program has delivered $3.7 billion worth of food, $691 million worth of medicine, and more than $500 million worth of supplies for electrical, water/sanitation, agricultural, education, oil industry, settlement rehabilitation and demining projects. Despite Iraqi obstructionism, oil-for-food has raised by 50% the daily caloric value of the ration basket and has steadily improved health care for Iraqis. Infrastructure repair in areas such as agriculture, electricity, and water and sanitation is being undertaken. Iraq has claimed it was unable to produce enough oil to meet oil-for-food ceilings because the UN refused to approve contracts for spare parts for its petroleum industry. The fact is that hundreds of millions of dollars of spare parts have been delivered and Iraqi oil production is expected to exceed pre-Gulf war levels. Since the start of the oil-for-food program, of the 7,560 contracts received, 5,901, or 78.1%, have been approved. Their total value is $7.7 billion. The 448 contracts on hold as of August 1999 include requests for items that can be used to make chemical, biological and nuclear weapons. Many of these items are on the list described in UNSCR 1051, the list of goods which must be notified to and inspected by UNSCOM and the IAEA. As Iraq is not permitting either organization to perform its UN-mandated functions, there can be no assurance that Iraq would not divert these dual-use items. Iraqi Obstruction, not Sanctions, Hinders Effectiveness For five years, Iraq resisted international efforts to establish the oil-for-food program. Concerned about the welfare of the Iraqi people, the Security Council attempted to create an oil-for-food program in 1991 that would allow Iraqi oil to be sold, with proceeds deposited in a UN-controlled account and used to purchase humanitarian goods for the Iraqi people. Iraq rejected the Security Council's original proposal. 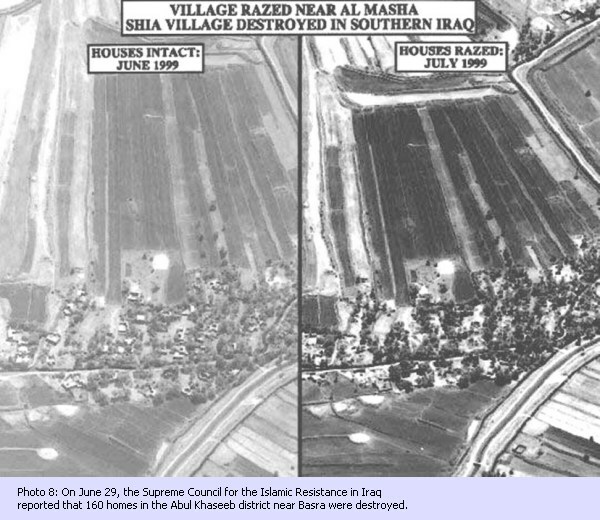 In 1995,­over Iraq's protests--the Security Council adopted another oil-for-food resolution. Again, Iraq refused to accept it. It was only after another year and a half of Iraqi delays and international pressure that the Iraq regime agreed to accept oil-for-food. The August 1999 UNICEF Report on Child Health demonstrates that Iraqi mismanagement, -- if not also deliberate policy -- not sanctions, is responsible for malnutrition and deaths. In Northern Iraq, where the UN administers humanitarian assistance, child mortality rates have fallen below pre-Gulf War levels. Rates rose in the period before oil-for-food, but with the introduction of the program the trend reversed, and now those Iraqi children are better off than before the war. Child mortality figures have more than doubled in the south and center of the country, where the Iraqi government -- rather than the UN -- controls the program. If a turn-around on child mortality can be made in the north, which is under the same sanctions as the rest of the country, there is no reason it cannot be done in the south and center (see chart 2). The fact of the matter is, however, that the government of Iraq does not share the international community's concern about the welfare of its people. Baghdad's refusal to cooperate with the oil-for-food program and its deliberate misuse of resources are cynical efforts to sacrifice the Iraqi people's welfare in order to bring an end to UN sanctions without complying with its obligations. The UN has reported that, despite Iraqi claims of infant malnutrition, the government of Iraq has ordered only a fraction of the nutrition supplies for vulnerable children and pregnant and nursing mothers recommended by the UN and for which money has been set aside under the oil-for-food program. Only $1.7 million of $25 million set aside for nutritional supplements has been spent by Iraq. In the past eighteen months, Iraq has ordered no nutritional supplements. The United Nations has reported that $200 million worth of medicines and medical supplies sit undistributed in Iraqi warehouses. This is about half the value of all the medical supplies that have arrived in Iraq since the start of the oil-for-food program. Saddam can move his troops and missiles around the country, but claims that he doesn't have enough transportation to distribute these medicines, even as he alleges that children are dying due to sanctions. Despite a 50% increase in oil revenues, Iraq has increased the amount earmarked for food purchases by only 15.6%. Baghdad has reduced from $8 million to $6 million the amount allocated to the supplemental nutritional support program for malnourished children and pregnant and lactating mothers. Rather than spend money to help its people, Iraq's leaders enrich themselves. With Iraqi oil revenues burgeoning, it's hard to understand why the people of Iraq aren't better off. The reason is because the government of Iraq is mismanaging the oil-for-food program, either deliberately or through incompetence. Despite reports of widespread health problems, the government has still not spent the full $200 million for medical supplies allocated under phase five of the oil-for-food program (which ended in May). Only 40% of the money was used to purchase medicines for primary care, while 60% was used to buy medical equipment. While the average Iraqi needs basic medicines and medical care, the government of Iraq spent $6 million on a gamma knife, an instrument used for complicated neurosurgery that requires extremely advanced training to use. Another several million was spent on a MRI machine, used for high-resolution imaging. Such exotic treatment is reserved for regime bodyguards and other members of the elite. This total of $10 million could instead have benefited thousands of Iraqi children if it had been spent on vaccines, antibiotics, and the chemotherapeutics necessary to treat the large numbers of children that are allegedly dying due to lack of medicine. While the people of Iraq go wanting, their leaders enrich themselves. In July 1999, Forbes Magazine estimated Saddam Hussein's personal wealth at $6 billion, acquired primarily from oil and smuggling. Medicines received through the oil-for-food program are sold by the regime to private hospitals at exorbitant prices. Members of the government and top military and security officials are provided with extra monthly food rations, Mercedes automobiles, and monthly stipends in the thousands of dollars. By comparison, the average monthly government salary is 6,500 dinars, or about $3.50. In addition to the revenues generated under the oil-for-food program, the government of Iraq earns money from other sources which it controls. Rather than spend these funds to help the people of Iraq, Saddam Hussein chooses to build monuments to himself. In addition, he deprives those in need of water and other scarce resources in order to favor elites and other supporters of the regime. 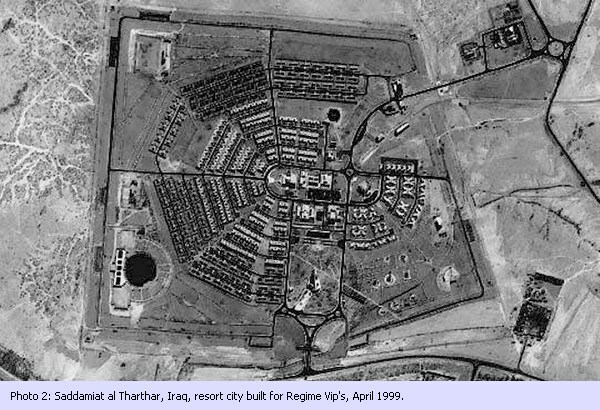 Saddam celebrated his birthday this year by building a resort complex for regime loyalists. 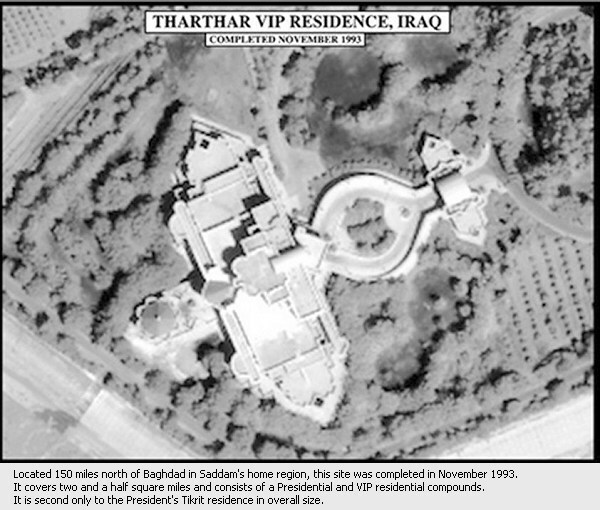 Since the Gulf War, Saddam has spent over $2 billion on presidential palaces. Some of these palaces boast gold-plated faucets and man-made lakes and waterfalls, which use pumping equipment that could have been used to address civilian water and sanitation needs. 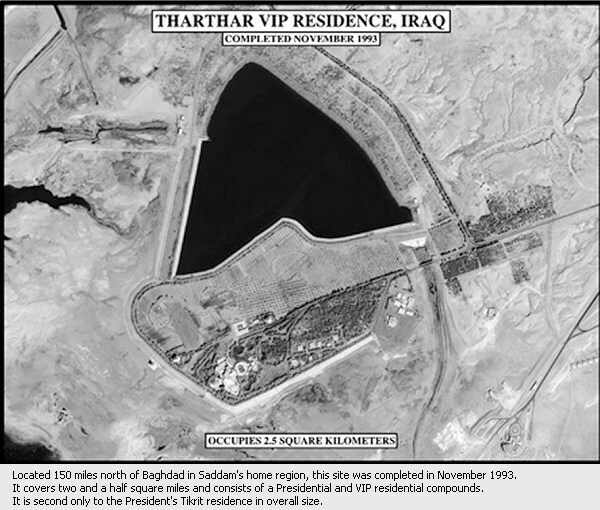 In April 1999, Iraqi officials inaugurated Saddamiat al Tharthar. Located 85 miles west of Baghdad, this sprawling lakeside vacation resort contains stadiums, an amusement park, hospitals, parks, and 625 homes to be used by government officials. This project cost hundreds of millions of dollars. There is no clearer example of the government's lack of concern for the needs of its people than Saddamiat al Tharthar (see photo 2). In July, Baghdad increased taxes on vehicle ownership and marriage dowries, after earlier increases in taxes, fees, and fuel and electricity prices. This is in part what pays for Saddam's palaces. Saddam also uses food rations, medical care, and other state resources to buy the loyalty of his inner circle and security forces. Iraq is facing its worst drought in 50 years. As a result, the government is restricting the planting of rice and told farmers not to plant summer crops without permission from the Ministry of Irrigation. The water levels of the reservoirs supplying Saddam Hussein's region of Tikrit, however, were at normal seasonal levels, while the flow of water to the southern cities was dramatically lower than during the previous two years. Saddam is diverting water to serve his political objectives, at the expense of the general population. 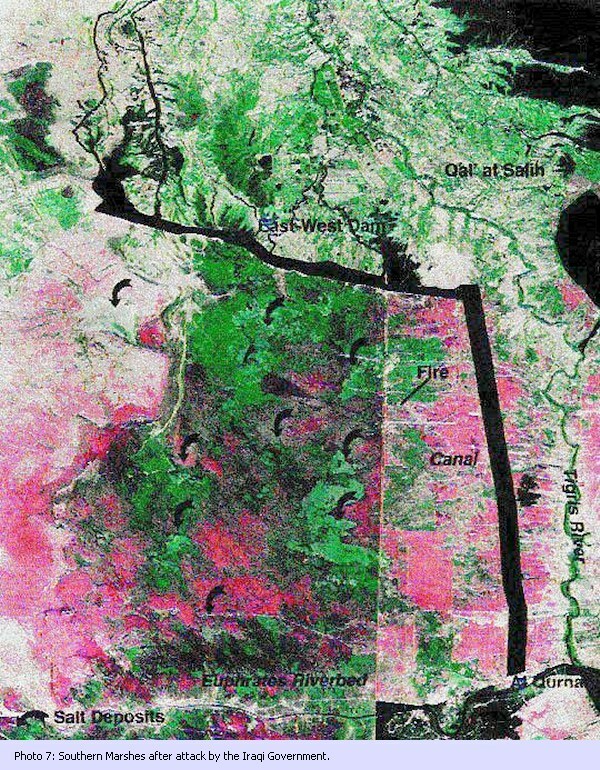 He is draining the southern marshes, causing grave environmental damage and forcible relocation of civilians in an attempt to eliminate opposition to the regime. He is murdering Shi'a clerics. He is destroying villages and forcibly relocating people in both the north and the south and destroying villages in the south. International human rights groups and others are gathering evidence and working to establish an international criminal court to try Saddam and his senior aides for war crimes and crimes against humanity. He has used chemical weapons against his own people. In Resolution 688 (1991), the UN Security Council condemned the Government of Iraq's repression of the Iraqi civilian population, which it concluded threatened international peace and security in the region. The Council demanded that Iraq immediately end this repression and allow immediate access by international humanitarian organizations to all those in need of assistance in all parts of Iraq. Iraq has neither ended the repression of its civilian population nor allowed outside organizations access to help those in need. 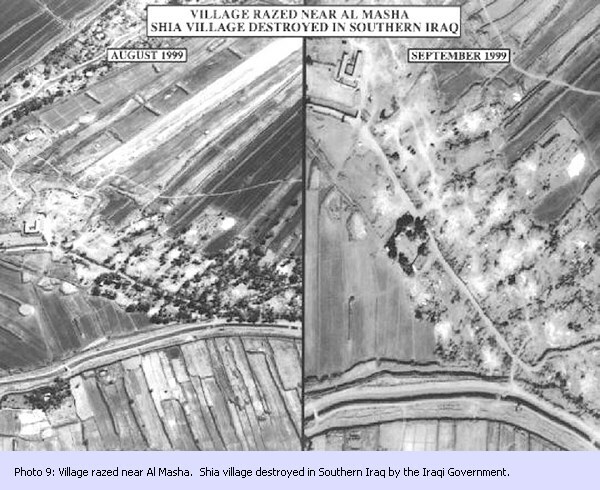 The government of Iraq uses military force to repress civilian populations throughout the country, resulting in the deaths of thousands and the destruction of entire villages. Iraq has refused to allow the UN's Special Rapporteur for Human Rights to return to Iraq since his first visit in 1992. The government of Iraq has refused to allow the stationing of human rights monitors as required by the resolutions of the UN General Assembly and the UN Commission on Human Rights. The regime expelled UN personnel and NGOs who, until 1992, ensured the delivery of humanitarian relief services throughout the country. Iraqi authorities routinely practice extrajudicial, summary or arbitrary executions throughout those parts of the country still under regime control. The total number of prisoners believed to have been executed since autumn 1997 exceeds 2,500. This includes hundreds of arbitrary executions in the last months of 1998 at Abu Ghraib and Radwaniyah prisons near Baghdad. In the 1970s and 1980s, the Iraqi regime destroyed over 3,000 Kurdish villages. 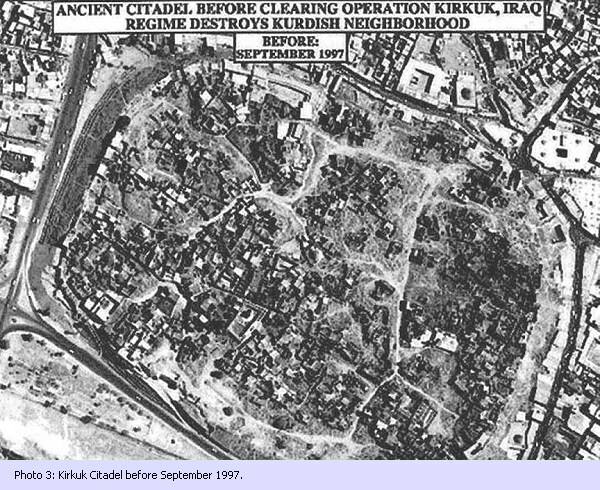 The destruction of Kurdish and Turkomen homes is still going on in Iraqi-controlled areas of northern Iraq, as evidenced the destruction by Iraqi forces of civilian homes in the citadel of Kirkuk (see Photo 3 & 4). In northern Iraq, the government is continuing its campaign of forcibly deporting Kurdish and Turkomen families to southern governorates. As a result of these forced deportations, approximately 900,000 citizens are internally displaced throughout Iraq. Local officials in the south have ordered the arrest of any official or citizen who provides employment, food or shelter to newly arriving Kurds. 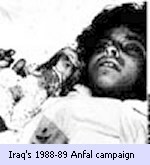 Iraq's 1988-89 Anfal campaign subjected the Kurdish people in northern Iraq to the most widespread attack of chemical weapons ever used against a civilian population. The Iraqi military attacked a number of towns and villages in northern Iraq with chemical weapons. In the town of Halabja alone, an estimated 5,000 civilians were killed and more than 10,000 were injured (see photo 5). The scale and severity of Iraqi attacks on Shi'a civilians in the south of Iraq have been increasing steadily. The Human Rights Organization in Iraq (HROI) reports that 1,093 persons were arrested in June 1999 in Basrah alone. Tanks from the Hammourabi Republican Guards Division attacked the towns of Rumaitha and Khudur on June 26, after residents protested the systematic maldistribution of food and medicine to the detriment of the Shi'a. Iraqi troops killed fourteen villagers, arrested more than a hundred more, and destroyed forty homes. On June 29, the Supreme Council for the Islamic Resistance in Iraq reported that 160 homes in the Abul Khaseeb district near Basra were destroyed (see photo 8). In March 1999, the regime gunned down Grand Ayatollah al Sayyid Mohammad Sadiq al Sadr, the most senior Shi'a religious leader in Iraq. Since 1991, dozens of senior Shi'a clerics and hundreds of their followers have either been murdered or arrested by the authorities,and their whereabouts remain unknown. In the southern marshes, government forces have burned houses and fields, demolished houses with bulldozers, and undertaken a deliberate campaign to drain and poison the marshes. Villages belonging to the al Juwaibiri, al Shumaish, al Musa and al Rahma tribes were entirely destroyed and the inhabitants forcibly expelled. Government troops expelled the population of other areas at gunpoint and also forced them to relocate by cutting off their water supply (see photo 6 & 7). The nature and magnitude of the crimes committed by Saddam Hussein and his regime since 1980 demand that all efforts be made to hold those individuals accountable for their crimes. We believe that Saddam Hussein and key members of his regime should be brought to justice for their past and current crimes. While its repression of the Iraqi people continues, the Iraqi regime still is far from complying with its obligations under United Nations Security Council resolutions. It has not fully complied with a single resolution. It has not fully declared and destroyed its WMD programs. It has not returned Kuwaiti and Third Country POWs and Missing Persons (UNSCRs 686 and 687). 605 Kuwaiti POW/MIAs and 34 Saudis remain unaccounted for. It has not stopped repressing its civilian population (UNSCR 688). UNSCR 687 and related resolutions 707, 715, and 1051 stipulate that Iraq must provide full, final and complete disclosure of all aspects of its nuclear, chemical, biological, and long-range missile weapons programs; allow unconditional inspection access by international monitors; cease any attempt to conceal, move, or destroy any material or equipment related to these programs; and cooperate with UN monitoring of relevant Iraqi facilities and trade activities. When these resolutions were passed, it was expected that compliance would require no more than 90 days. Instead, nine years later, sanctions remain in place because Iraq has decided to (1) hide weapons and major components of these programs, (2) secretly destroy older, less-capable weapons and equipment, and (3) give UN inspectors fraudulent declarations to mask weapons and equipment that are still hidden. Iraq began playing hide-and-seek with UN inspectors in 1991. In December 1998, Saddam stopped all cooperation with the UN, refusing to let any weapons inspectors into the country. 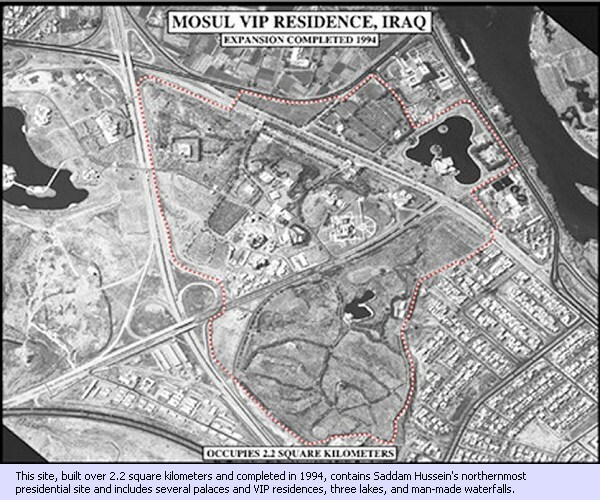 In July 1998, Iraq seized from the hands of UNSCOM inspectors an Iraqi Air Force document indicating that Iraq had misrepresented the expenditure of over 6,000 bombs which may have contained over 700 tons of chemical agent. Iraq continues to refuse to provide this document to the UN. Iraq continues to deny weaponizing VX nerve agent, despite the fact that UNSCOM found VX nerve agent residues on Iraqi SCUD missile warhead fragments. Based on its investigations, international experts concluded that "Iraq has the know-how and process equipment, and may possess precursors to manufacture as much as 200 tons of VX ... The retention of a VX capability by Iraq cannot be excluded by the UNSCOM international expert team." Iraq has refused to credibly account for 500 tons of SCUD propellant, over 40 SCUD biological and conventional warheads, 7 Iraqi-produced SCUDs, and truckloads of SCUD components. Iraq refuses to allow inspection of thousands of Ministry of Defense and Military Industries Commission documents relating to biological and chemical weapons and long-range missiles. In 1995, Iraqis who conducted field trials of R-400 bombs filled with biological agents described the tests to UNSCOM experts in considerable detail, including the use of many animals. These field trials were reflected in Iraq's June 1996 biological weapons declaration. Yet, amazingly, Iraq now denies that any such trials were conducted at all. In September 1995, Iraq finally declared the existence of two projects to disseminate biological agents from Mirage F-1 and MiG-21 aircraft, yet there is no evidence that the prototype weapons and aircraft were ever destroyed. There is also no evidence that the 12 Iraqi helicopter-borne aerosol generators for biological weapon delivery were ever destroyed. Apart from one document referring to a single year, no Iraqi biological weapon production records have been given to the UN -- no records of storage, of filling into munitions, or of destruction. This is why UNSCOM refers to Iraq's biological weapons program -- which deployed SCUD missile warheads filled with anthrax and botulinum toxin to be ready for use against Coalition forces -- as a "black hole." The Iraqis have repeatedly changed their story about their biological weapons warheads. Iraq has revised several times its declarations regarding the precise locations of warhead destruction and the fill of warheads. 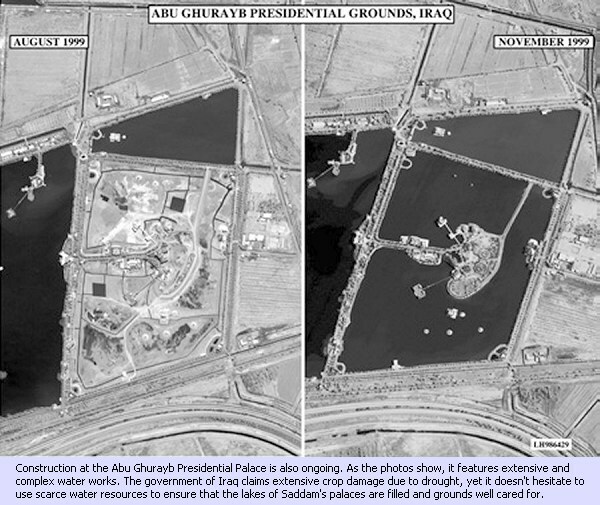 The movements of concealed warheads prior to unilateral destruction, claimed by Iraq, have been proven to be false. At the request of the UNSC, Brazilian Ambassador Amorim led a review of the mechanisms designed to ensure Iraqi disarmament. His 7 April 1999 report affirmed that future work "should be based on the full implementation of the plans for ongoing monitoring and verification approved by Security Council Resolution 715 (1991)" and called for Iraq to provide UNSCOM and IAEA inspectors with all the rights called for by UNSC resolutions 687, 707, and 1051." Rather than do so, Saddam has refused to allow weapons inspectors into Iraq. Iraq under Saddam Hussein remains dangerous, unreconstructed, and defiant. It has not disarmed. It has never apologized or expressed regret for the invasion of Kuwait. It continues to repress its people. This is a dangerous regime that threatens its neighbors, has a long history of aggression, has ambitions to dominate the Gulf by force, and retains the capability to do so. Far from apologizing for its invasion of Kuwait, Iraq continues to assert that its actions were justified. *On this year's ninth anniversary of the invasion of Kuwait, the government newspaper Babel -- owned by Saddam's son Uday -- stated "We still believe that what we did on August 2, 1990, was the right response to foil a large and abortive conspiracy." In an editorial on August 2, 1999, al Thawra, the regime's mouthpiece, referred to Iraq's invasion of Kuwait as, "the honorable day of the call." In 1994, Saddam attempted to blackmail the UN Security Council into lifting sanctions by massing his forces for another invasion of Kuwait. In response, the UNSC passed Resolution 949, ordering Iraq to withdraw its Republican Guard forces from southern Iraq. Not only does Baghdad consider its invasion of Kuwait "honorable," but Saddam Hussein has gone so far as to call for the overthrow of fellow Arab leaders and to attempt to murder the Emir of Kuwait and former president George Bush. In Saddam's Army Day speech of January 6, 1999, he said: "Release your anger and rebel against the defiled ones who are playing with your fate and the fate of the nation.... Rebel against those who are proud of the friendship of the United States, those who are proud of being U.S. protégées..."
In 1993, Iraq organized an attempt to assassinate former U.S. President George Bush and the Emir of Kuwait. 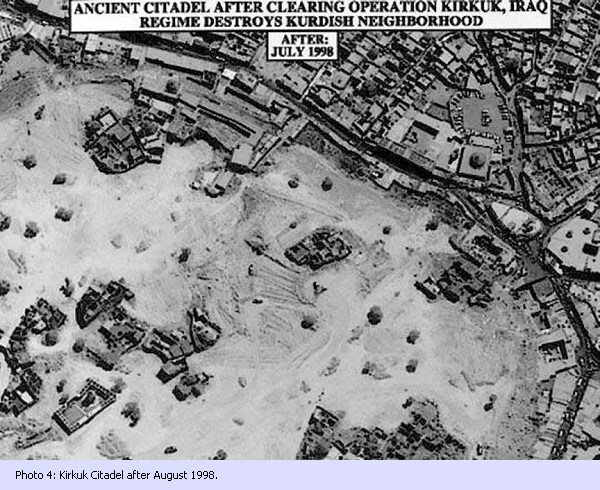 *In August 1996, the regime's forces attacked the Kurdish-held city of Irbil. Within hours, Iraqi secret police had swarmed over the city, arresting hundreds and killing scores of suspected oppositionists. Baghdad continues to harbor the Muhjahideen e-Khalq (MEK), Iranian dissents who conduct a widespread terrorist campaign to support their political agenda. In the past, the MEK has been responsible for attacks on Americans, (including participating in the seizure of the US embassy in Tehran in 1979), Iraqis, Iranians, and Europeans. Saddam continues to attack coalition aircraft enforcing the no-fly zones, which were established to prevent Saddam from attacking Kurdish and Shi'a civilians, in violation of UNSC Resolutions 688 and 949. Saddam retains the capability to inflict significant damage upon Iraq's neighbors and its own civilian population. Since December 1998, Saddam Hussein has prevented UN weapons inspectors from even entering Iraq. We do not know for sure what he is doing under the roofs of the weapons factories they routinely monitored. So, in addition to the weapons he has worked so hard to hide since 1991, Saddam may well have his experts making chemical and biological weapons, and pursuing nuclear weapon designs. Iraq is capable of assembling its prohibited Al-Hussein long-range missiles with key parts known to have been stripped from destroyed imported SCUDs. Iraq has refused to account for precursor chemicals capable of making as much as 200 tons of VX nerve agent. Iraq has the know-how and equipment to weaponize VX, despite its continuing denials. Iraq loaded VX, anthrax, botulism toxin, and other chemical and biological agents into Al-Hussein missile warheads and deployed them during the Gulf War. Iraq loaded thousands of munitions such as aerial bombs, tactical rockets, and artillery shells with a variety of chemical and biological agents similar to those used against Iran and against Iraqi civilians. Without sanctions, Saddam would be free to use his resources to rearm and make good on his threats against Kuwait and the region. The United States wants to see Iraq return as a respected and prosperous member of the international community. As long as Saddam Hussein is in power, however, we don't believe that that's going to happen. Given Saddam Hussein's long record of aggression against his neighbors and repression of his own people, and absent any proof that he has in fact disarmed, it is important that the international community remain united in containing this dangerous regime. Sanctions will remain in place until UNSC requirements are fully met. Only a robust, fully empowered inspection team can determine if Iraq is fully disarmed. A weak inspection team will not be effective. No-fly zones will be enforced to prevent Saddam from using his air force and helicopters to slaughter his people, as he has repeatedly done in the past. No-fly zones also contain Saddam Hussein's ability to threaten his neighbors. The United States will use force if Saddam threatens Iraq's neighbors or coalition forces, reconstitutes or deploys WMD, or moves against the Kurds. Expanding Iraqi oil sales making more money available for oil-for-food. Working to get Iraq to order more food, especially nutritional supplements for children and lactating mothers, which it has until now refused to do. Expediting approval of contracts under oil-for-food. Supporting a draft UNSC resolution which proposes lifting the oil-for-food ceiling on oil sales. The international community, not Saddam Hussein, is caring for the Iraqi people. Saddam's record over the past 10 years, however, demonstrates that he will never comply with UN resolutions and that he will continue to repress his own people and threaten his neighbors. That is why we believe that the only way to address the security needs of the international community and the needs of the people of Iraq is through a new government in Baghdad, one that is committed to living in peace with its neighbors and respecting the rights of its citizens. Iraq, the region, and the world would be better off with a new government in Iraq. We support the territorial integrity of Iraq. One nation, whole and free. Saddam Hussein is not what's holding Iraq together; he's what's breaking it apart. The United States believes that if there is to be change, it must come from within Iraq, led by Iraqis. We do not seek to impose an American solution or a foreign opposition on the people of Iraq. In a post-Saddam Iraq, the United States will take the lead to foster economic development, restore Iraqi civil society, rebuild the middle class, and restore Iraq's health and education sectors. Saddam Hussein and his closest aides have committed a long list of criminal violations of international humanitarian law and the laws and customs of war. Saddam Hussein and his closest aides should be investigated, indicted, and prosecuted for these crimes. The goal of the United States is to see Saddam indicted by an international tribunal. We are gathering our own evidence against Saddam and providing support to groups working on Iraqi war crimes issues. The use of poison gas and other war crimes against Iran and the Iranian people during the 1980-88 Iran-Iraq war. Iraq summarily executed thousands of Iranian prisoners of war as a matter of policy. The "Anfal" campaign in the late 1980's against the Iraqi Kurds, including the use of poison gas on cities. In one of the worst single mass killings in recent history, Iraq dropped chemical weapons on Halabja in 1988, in which as many as 5,000 people -- mostly civilians -- were killed. Crimes against humanity and war crimes arising out of Iraq's 1990-91 invasion and occupation of Kuwait. Crimes against humanity and possibly genocide against Iraqi Kurds in northern Iraq. This includes the destruction of over 3,000 villages. The Iraqi government's campaign of forced deportations of Kurdish and Turkomen families to southern Iraq has created approximately 900,000 internally displaced citizens throughout the country. Crimes against humanity and possibly genocide against Marsh Arabs and Shi'a Arabs in southern Iraq. Entire populations of villages have been forcibly expelled. Government forces have burned their houses and fields, demolished houses with bulldozers, and undertaken a deliberate campaign to drain and poison the marshes. Thousands of civilians have been summarily executed. Possible crimes against humanity for killings, ostensibly against political opponents, within Iraq. The United States wants to see Saddam and his close aides investigated, indicted, and if possible, prosecuted by an international tribunal. The Yugoslav war crimes tribunal's May 1999 indictment of Slobodan Milosevic for crimes against the Muslim Kosovar Albanian people shows that when crimes are committed on the scale that Saddam Hussein has committed them, justice should be done not just in the name of the victims, but in the name of all humanity. The United States is helping international efforts to gather evidence. The U.S. Government helped human rights and opposition groups collect 5.5 million pages of captured Iraqi documents from the "Anfal" campaign against the Iraqi Kurds in the 1980's. These documents show the routine nature of the atrocities and abuses committed by Saddam Hussein's regime against the Iraqi people. These documents are being catalogued, indexed, and electronically transcribed for use by investigators and prosecutors. Tens of thousands of pages of Iraqi documents captured during Operation Desert Storm in 1991 are also now being indexed and computerized. The originals themselves will be returned to Kuwait and computerized copies will be made available to human rights groups, scholars, investigators and prosecutors. 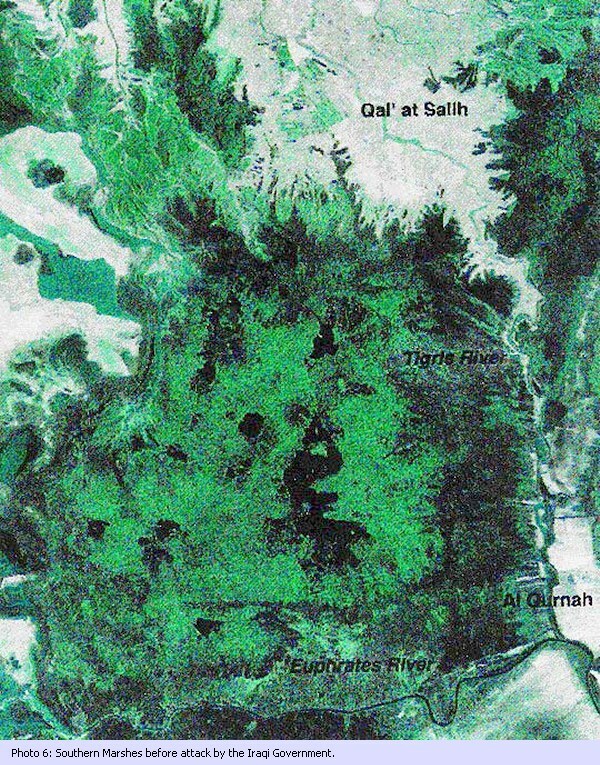 The U.S. has large amounts of information on Iraq's campaign to destroy the Southern Marshes and repression of the people of southern Iraq. We are preserving videotapes of Iraqi war crimes that can be used for eventual prosecution of Iraqi war crimes. The United States also has classified documents, some of which can be declassified and shared with an international tribunal or commission. 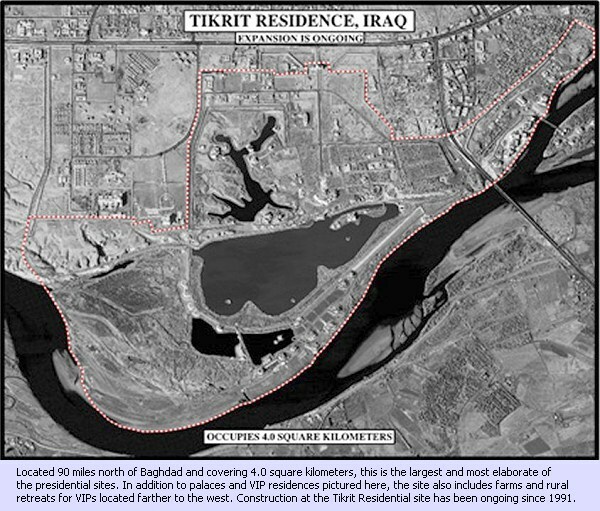 Locating witnesses to Iraqi war crimes and help build evidence that could be used to justify the arrest of senior Iraqi officials traveling outside the country. Helping analyze captured Iraqi documents and translate them so that the world can be educated about Iraqi war crimes. Efforts were made to arrest Izzat Ibrahim, Vice Chairman of the Revolutionary Command Council, while he was visiting Austria in August of 1999. A few weeks later, Iraqi Deputy Prime Minister Tariq Aziz decided not to travel to Italy to attend a conference entitled, "Peace, Prosperity, and an End to War." As one human rights group said, "The only suitable venue for Tariq Aziz to express his opinions is that of a courtroom where we will all have a chance to hear about his government's record on peace, prosperity and war." Photo 9: click here or on image for enlargement and caption. Over 94% of all requested oil-for-food goods have been approved. That is $8.9 billion worth of humanitarian items for the Iraqi people. No holds are placed on food and medicine. The 6% of goods, which are on hold, include contracts for dual-use items that Iraq can use to rebuild its military capabilities. Holds are placed on contracts that do not have enough information to determine whether they include dual-use items. Once that information is provided, these holds are often released. In other cases, holds are placed on contracts submitted by firms with a record of sanctions violations. Contract holds are not the problem. It is Saddam Hussein who continues to reject UN recommendations for ordering adequate amounts of food and other basic humanitarian goods. Instead, he seeks to use the oil-for-food program to rebuild his army and export oil in order to build palaces and obtain luxuries for his family and regime supporters. Holds on inappropriate contracts help prevent the diversion of oil-for-food goods to further Saddam's personal interests. Proposed oil-for-food contracts must be approved by all members of a committee made up of Security Council member states. Only a small number of such contracts are put on hold. Since its inception, the Sanctions Committee has approved 94% of all requested oil-for-food goods. That is over $8.9 billion worth of contracts. The Sanctions Committee has put holds on less than 6% of the goods submitted to it. NONE OF THE CONTRACTS ON HOLD ARE FOR FOOD. Iraq now imports about as much food as it did before the Gulf War. Over 9,200 contracts have been reviewed by the Sanctions Committee; all but 694 have been approved. Many of these 694 contracts are delayed pending receipt of additional information from the contracting companies. Iraq usually delays submission to the UN of the list of goods it wants to order during each six-month phase of the oil-for-food program until the last minute. In this way it tries to sneak in proscribed items by forcing the UN either to halt the flow of oil-for-food goods or to approve dubious contracts. The United States takes its responsibilities very seriously and reviews each proposed oil-for-food contract thoroughly. We know that the Iraqi regime is trying to use the program to import dual-use items for military uses rather than for their intended purpose of relieving the suffering of the Iraqi people. The U.S., in reviewing oil-for-food contracts, cannot and will not ignore the known intentions of the government of Iraq to obtain weapons, including chemical and biological weapons. These intentions have been demonstrated repeatedly in the past nine years. Contracts should not be blocked without serious cause. There are good reasons why each delayed contract has been put on hold. The most frequent reason for placing a hold on a contract is the information that accompanies the contract. There are currently over 250 contracts on hold because the technical information or the end-use information in the contract is insufficient to judge the dual-use potential of the ordered goods. The United States has placed a hold on over 200 contracts that include dual-use items. The Security Council has created a list of items which can be used to build weapons of mass destruction and which the Security Council has said must be monitored by UNSCOM or the IAEA. With Iraq blocking those agencies from performing these missions, it would be dangerous to allow dual-use items into Iraq. There are 55 contracts on hold which are destined for the Basrah refinery, where Iraq produces gasoil which it smuggles out of Iraq in violation of UN sanctions. The profits from this illicit trade are used by the government of Iraq to procure items prohibited by sanctions, including luxuries for members of Saddam's inner circle, and continued construction of elaborate palaces. There are 90 contracts on hold because we have information that they are linked to a company that is operating or has operated in violation of sanctions. *Another 14 contracts are on hold because the goods are destined for an oil export facility, which does not have the required UN authorization to operate. Another 23 contracts are on hold because they contain financial terms that the Committee agreed are not allowed under Security Council resolutions. Despite the Iraqi regime's persistent efforts to obstruct the oil-for-food program and manipulate it for the purposes of rewarding Saddam's supporters, the United States is committed to doing everything we can to see that the program benefits the Iraqi people. The Iraqi government continues to smuggle goods out of Iraq to get revenue for its illicit activities. In addition to illegally exporting oil and gasoil, twice in the last three months ships have been caught trying to smuggle tons of food and nursing supplies out of Iraq to get hard currency for the Iraqi regime. Although the primary responsibility for the well-being of the Iraqi people lies with the Government of Iraq, the Iraqi government spends the revenue it controls on goods not permitted under sanctions, including luxury items for the regime's inner circle, rather than the needs of the Iraqi people. Contrary to recommendations from the UN, it drags its heels in ordering nutritional supplements and other humanitarian goods needed by the people of Iraq. Stark evidence of the government's callous policies was documented in a recent UNICEF survey, which found that child mortality rates doubled in South and Central Iraq, where Saddam Hussein controls distribution of humanitarian assistance, but child mortality rates actually dropped in the North, where the UN controls distribution. This resolution reaffirms Iraq's obligations to disarm, to provide for the needs of its people, to account for Gulf War missing and to return stolen Kuwaiti property. All members of the UN Security Council have agreed, again, that these obligations on Iraq are unsatisfied and continue. The resolution establishes a new disarmament body and monitoring body -- UNMOVIC -- that maintains UNSCOM's mandate, rights, facilities and immunities. It also includes measures to ensure that -- despite Saddam Hussein's best efforts to prevent it -- the people of Iraq receive the humanitarian goods they require. Iraq can sell as much oil as it needs to meet the humanitarian needs of the Iraqi people, but all revenue remains under UN control. No Council members voted against this resolution. All Council members are committed to implementation. This resolution was adopted under Chapter VII of the UN charter. It is obligatory, even with abstentions. The resolution establishes the UN Monitoring and Verification Commission, UNMOVIC. A subsidiary body of the Security Council, UNMOVIC retains UNSCOM's mandate, rights, privileges, facilities and immunities. The UN Secretary General (SYG) will nominate, and the Security Council will approve, the UNMOVIC Executive Chairman, who with the SYG, sets up UNMOVIC. UNMOVIC and IAEA submit work programs for Council approval (includes monitoring plan and key disarmament tasks). Overall IAEA role unchanged. Iraq must fulfill key disarmament tasks. Iraq must cooperate with inspectors in all respects: monitoring and unresolved disarmament issues. Iraq must allow access for any inspection. If Iraq fulfills key disarmament tasks and cooperates with inspectors for 120 days after reinforced monitoring is fully operational, the Council could act to suspend sanctions, provided that appropriate controls are in place. There will be no change in sanctions unless Iraq cooperates and fulfills key disarmament tasks. If Iraq fulfills key disarmament tasks and cooperates in all respects with arms inspection teams for 120 days after reinforced monitoring is fully operational, the Security Council will consider a temporary suspension of export and import sanctions -- with effective financial and other controls remaining in place to ensure that Iraq does not exploit the situation to acquire prohibited items. Under suspension of sanctions, Iraq could import and export civilian goods for humanitarian purposes. The embargo on military imports would remain in place, and dual-use items would continue to require prior approval. Suspension must be renewed by a positive vote of the Security Council every 120 days. If Iraq ceases cooperation, sanctions would be automatically reimposed. In this resolution, the members of the Security Council commit themselves to take all possible steps to ensure that -- despite Saddam Hussein's best efforts to prevent it -- the people of Iraq receive the humanitarian goods they require. Improvements to oil-for-food go into effect immediately. Iraq can sell as much oil as it needs to meet the humanitarian needs of the Iraqi people, but all revenue remains under UN control. The resolution also makes a number of changes that should expedite delivery of humanitarian items and allows Iraqis easier access to a greater range of basic goods. The Sanctions Committee will define a list of goods for automatic approval. This will not include dual-use items with potential use for either military or Weapons of Mass Destruction purposes. The Secretary General will plan, with UNSC approval, use of oil-for-food money for the local purchase of goods and services. The resolution reiterates the obligation on Iraq to improve the oil-for-food program: to distribute goods more quickly and to help especially women, children, the elderly, etc. The SYG is requested to maximize program effectiveness and report obstacles to the Security Council. Since the end of the Gulf War, Saddam Hussein has directed and sustained a multi-billion dollar palace construction program while pleading that the UN sanctions keep him too poor to feed and provide health care for his people. While he keeps Iraq's hospital shelves bare and shows them to journalists, Saddam restricts access to the new and ornate palaces to himself and his chosen admirers of any given moment. Moreover, Saddam fits out these monuments with the finest foreign materials -- from golden plumbing to the finest European marble and crystal chandeliers -- smuggled in despite the embargo that Baghdad propaganda falsely claims blocks the import of food and medicine. 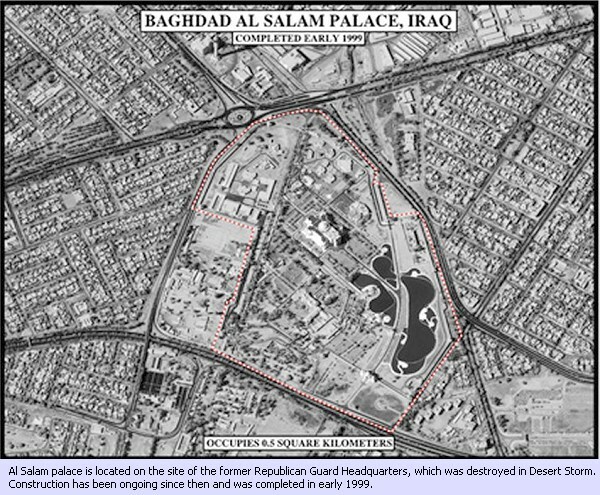 Saddam Hussein pays for these palaces with that part of the Iraqi national wealth that he has managed to keep under his control and out of the UN's mandatory oil-for-food program. Through that program, the UN controls how Iraqi oil revenues are spent and compels the regime to invest Iraq's oil wealth for the benefit of its people. But every day that he remains in power, Saddam lets his favored supporters steal hundreds of thousands of barrels of oil from the Iraqi people to enrich themselves, in direct violation of UN resolutions. Most Iraqis and the few foreign visitors to Iraq only get to see the outer walls of Saddam's monuments to his glory. 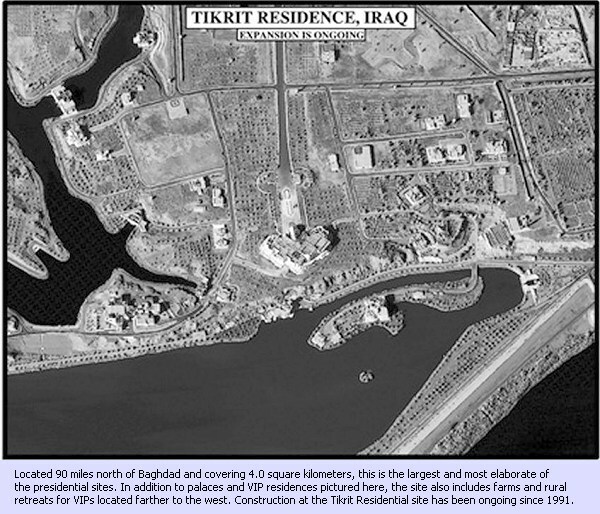 This report provides satellite images that allow Iraqis and the rest of the world to see better how Saddam Hussein spends some of the money that he is able to steal from the national wealth of the Iraqi people. Photographic evidence confirms that Saddam Hussein and his regime have sustained a non-stop program of palace building since 1991. Saddam has been spending billions of dollars on the man-made lakes, waterfalls, marble, and other luxuries that make up his palaces and those of his supporters. At the same time, Saddam parades well-intentioned foreigners to gawk at the sick and hungry of Iraq, as he pleads that UN sanctions prevent him from buying or importing his people's most basic needs. 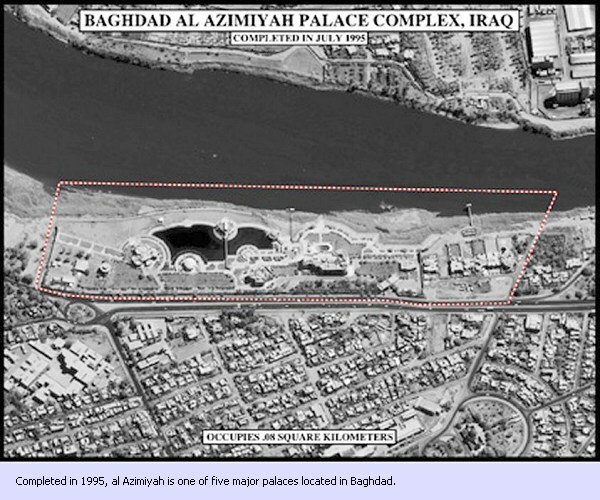 Among the more notable features of these palaces are: extensive security facilities to protect the regime from its own people; elaborate gardens which require large amounts of water, often in drought-stricken areas; and sophisticated waterfalls and other waterworks using pumps and other infrastructure that the regime says sanctions prevent it from importing for the Iraqi people. Saddam ruthlessly protects the extent of his luxury. According to Iraqi opposition sources, Saddam recently ordered the execution of one of the Iraqi architects who worked on presidential palaces in Tikrit, Al-Hillah, Al-Azimiyah, and Al-Wafa. His crime was to describe to friends the sumptuousness and lavishness of Saddam's palaces, and the swimming pools, fish aquariums, and deer farms in the vicinity of some of them. A circular was then sent around to workers in the engineering department of the Presidential Office warning them that the harshest punishment will be inflicted on anyone who talks about the presidential sites, even to family members. 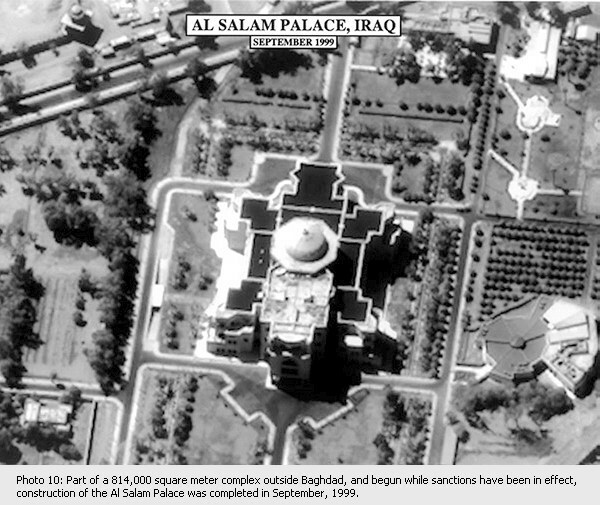 Our knowledge of the inside of Saddam's palaces comes from first-hand information from international observers who have traveled to Iraq and visited the palaces. Where does Saddam get the billions of dollars needed to build these palaces? Part of it comes from funds he controls directly. Part of it comes from oil produced and exported in violation of UN Security Council resolutions. These resolutions compel Saddam to spend revenues from the sale of Iraq's oil solely for the benefit of the Iraqi people. In order to fund his palace construction and other illicit expenditures, Saddam is smuggling substantial quantities of it abroad. 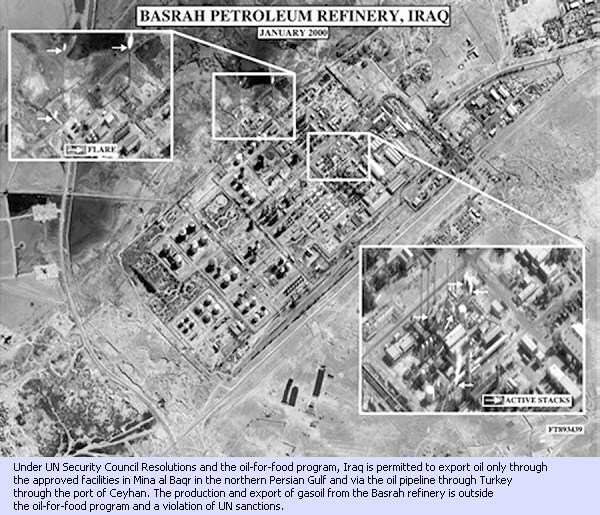 The Basrah refinery was put out of operation in Operation Desert Fox in 1998. Iraq has rebuilt it however, and the refinery is operating at near capacity, which is approximately 140,000 barrels per day. Under UN Security Council Resolutions and the oil-for-food program, Iraq is permitted to export oil only through the approved facilities in Mina al Baqr in the northern Persian Gulf and via the oil pipeline through Turkey through the port of Ceyhan. The production and export of gasoil from the Basrah refinery is outside the oil-for-food program and a violation of UN sanctions. The Iraqi government claims that sanctions prevent it from getting spare parts needed to repair its oil industry and that this is to blame for low production levels. 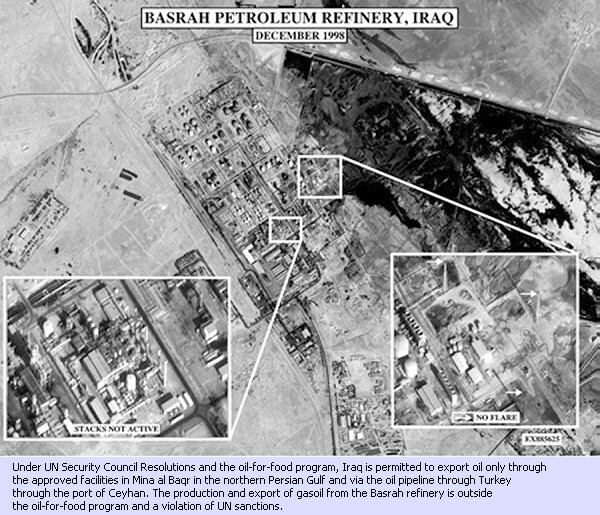 The activities of the Basrah refinery prove that such claims are false. Clearly, Iraq has no problem getting spare parts for its oil industry. The problem is that the regime of Saddam Hussein prefers to produce and export oil illegally, outside the oil-for-food program so that he can control the revenues and use them for his own personal aggrandizement. Since repairing the Basrah refinery, Iraq has steadily increased the amount of oil illegally exported via the Persian Gulf. 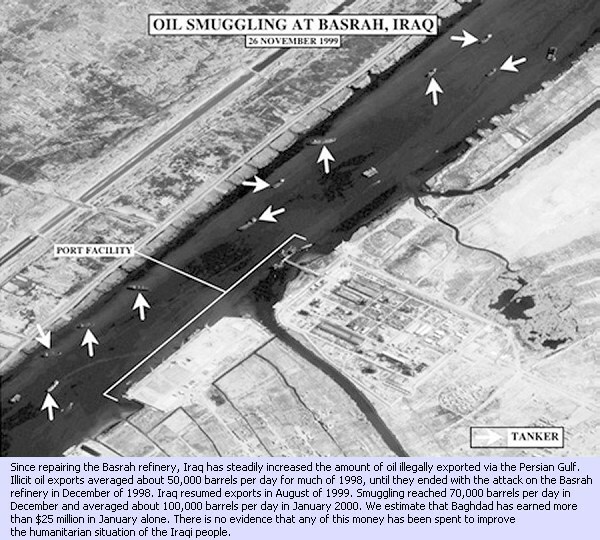 Illicit oil exports averaged about 50,000 b/d for much of 1998, until they ended with the attack on the Basrah refinery in December of 1998. Iraq resumed exports in August of 1999. Smuggling reached 70,000 b/d in December and averaged about 100,000 b/d in January 2000. We estimate that Baghdad has earned more than $25 million in January alone. There is no evidence that any of this money has been spent to improve the humanitarian situation of the Iraqi people.